Welcome to this episode of the Real Fast Results podcast! The special guest for today’s show is here to offer his advice and help you to get more visibility for your books, information products, or anything else you may be trying to market. 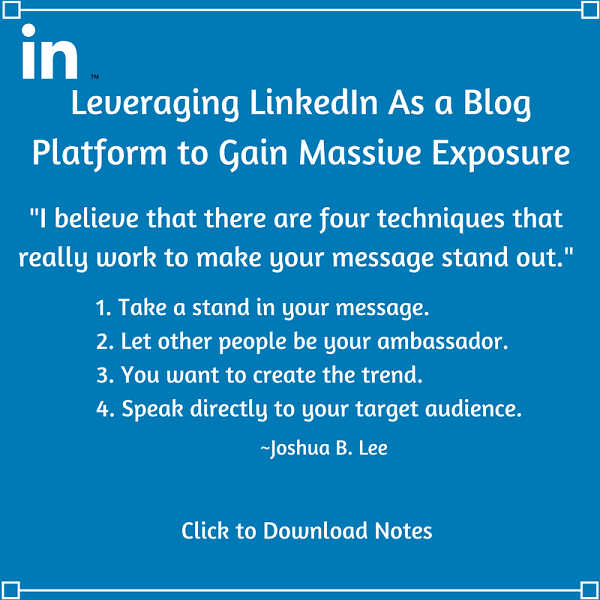 His name is Joshua B. Lee, and he is a strategic growth coach, meaning that he helps individuals scale themselves and their companies. He’s also the author of Balance is Bullsh*t: How to Successfully Integrate Work & Life. Joshua is very good at incorporating everything that’s good about marketing, life, and making money. I appreciate you having me on the show. If you stay on and listen, I’m going to share my #1 business technique with you. It has allowed me to be able to grow multiple companies to 6-7 and sometimes even 8 figures, and be able to gain the authority that I’ve needed to be able to do that. I’ve been in over 200 online publications because of it. LinkedIn works in multiple different companies. I’ve helped many companies over the last decade. I’ve used this business technique in all of them, and in multiple verticles, and they’ve been able to leverage it every single time. There are multiple social platforms out there, and one of the biggest things that I see is that people are trying to leverage each in the world that they live in. Everyone tries to go in through Facebook, through Twitter, or Instagram. One of the ones that I see people really putting time and effort into is LinkedIn. I saw recently that this platform has over 500 million members. It was purchased by Microsoft for $26.2 billion, which is their largest cash purchase ever. Not only that, I think in 2012, they spend $90 million on their publishing platform. If you are a person who is trying to put out content and impact people with the written word, this is a platform that is perfect to do that on. I’ll make it as easy as possible. You can go to JoshuaBLee.com. There you can find out more about what services we offer and what products we have. You can schedule a time to jump on a phone call directly with me.